PARIS, Ohio — Whether he was pushing his tractors across the living room floor or in the dirt of the backyard, ever since he was child, Bill Brown knew he wanted to be a farmer. His parents didn’t have the production agriculture background or knowledge to pass on to him — having experience only with small, backyard vegetable gardens and a few horses — so Brown would have to learn from the ground up. Now 22, Brown has turned himself into a young entrepreneur and farmer, finding a niche market in poultry. When he joined Minerva FFA in high school, Brown and his younger brother, Wylie, worked with a neighbor to grow sweet corn on her property for Brown’s first supervised agricultural experience (SAE) project, until that neighbor died. “I needed another project and about that same time, my mom met a guy in East Rochester who raised chickens and needed someone to help feed them,” he said. 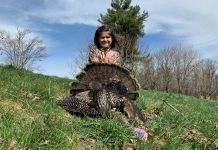 When it became apparent that Brown knew what he was doing in caring for the birds, the farmer challenged Brown to sell some of his broilers — which he successfully did at the local farmers market. 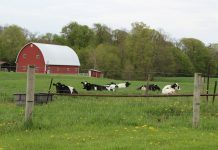 In 2011, Brown decided to go into business for himself, and Brown Bros. Farms, LLC was started with the help of his brother. 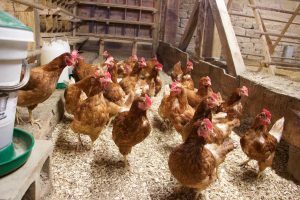 “We started with around 1,100 broilers and 40 turkeys, and it just kind of grew from there,” he said. Currently, Brown raises around 850 turkeys — all sold fresh around the Thanksgiving holiday — and 4,500 broilers a year. He also ventured into the egg business with 75 layers and hopes to expand to 200 layers in the next year. Bill Brown sells fresh poultry products at local farmers markets as well as through direct sales. 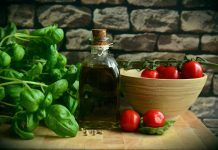 His website, brownbrothersfarms.com, allows customers to select the products they want and have them shipped right to their doorstep. While still in high school, Brown was mowing grass for a woman who ran the Alliance Farmers’ Market. She offered the Marlington and Minerva FFA chapters each a table at the farmers market to sell their products. “I was the only one to take advantage of the offer, so the next year, I bought my own table,” said Brown. He was doing around five markets a week when he decided to expand into Columbus, where he was introduced to the Worthington Farmers Market. When it came time to consider college, his high school counselors suggested he study poultry science at Ohio State University, but Brown was afraid of losing the momentum of his business if he went away to college. 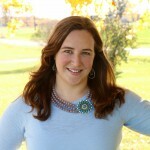 See Brown’s Ag College Guide profile here. “My older sister said, ‘you already know how to grow the birds; if I were you, I would look at the business side’,” said Brown. So Brown signed up for a new entrepreneurship program at Stark State College, in North Canton. 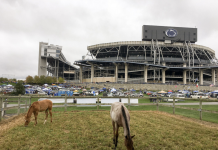 Toward the end of his two years at Stark State, Brown began to wonder how recognizable the programs he took at Stark State would be to employers, if he had to get a job off the farm. So he switched his major to business management, picked up a few more classes to get his associate’s degree and a one-year entrepreneurship certificate at Stark State and made the transition to a four-year program at Kent State University at Stark. Brown will graduate in the fall of 2017 with his bachelor’s in business management, specializing in business administration. Currently Brown raises around 75 Golden Buff hens for eggs and plans to expand to around 200 layers. Brown said the business program is more generalized, compared to the specialized business he runs. “A lot of what I have learned in the classroom, I already learned it the hard way in life,” he said. But the classes are giving him a different perspective on how he runs his business. Several of the classes he took stressed the importance of business plan writing, which he admits is something he should be using more. 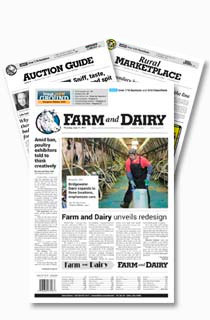 “Especially in agriculture, the economy, the markets, they are always changing,” he said. Brown was forced to make some changes to his own marketing strategy to keep up with customer demand. While supplying chickens at the Alliance Farmer’s Market, a customer told Brown, while his product looked nice, she didn’t like that Brown fed his chickens GMOs. At the time, Brown wasn’t sure what to make of the statement but, “I didn’t want customers to walk away because they weren’t happy.” So he did some research and started to transition his birds to a non-GMO diet, mixing his own feed to meet his own specifications. “You have to see what the customer wants,” he said. “It doesn’t matter how great (the product) is if you can’t sell it.” He had to increase his prices, but, for the most part, he found his customers are willing to pay for a premium product. “You have to know your cost and know what you have to do for your products, because at the end of the day you have to make money,” he said. Brown found that by answering all his customers’ questions about his operation honestly, they believe in him and his product. “Part of my responsibility is ensuring the customer gets the information they need. The ball in their court after that,” he said. Bill Brown learned the importance of customer service early on when customer turned down his product because it wasn’t non-GMO. 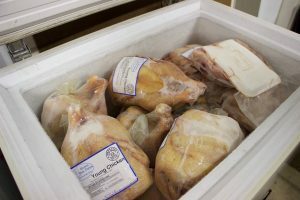 Brown can provide his customers whole chickens, cut-ups, boneless chicken breasts, ground chicken, chicken breast patties, and other traditional and non-traditional cuts. 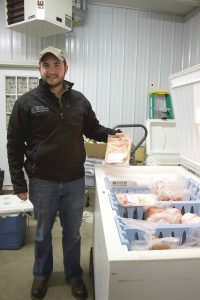 Working with a local butcher, he is able to provide everything freezer wrapped and can ship products right to his customers’ door when they order at brownbrothersfarms.com. Brown said he also does some sales from the farm by appointment, sells some wholesale birds to local growers he knows, and provides poultry to a restaurant in Worthington — all on top of keeping up with a handful of farmers markets throughout the summer. For Brown, having a college degree is important because, as much as he enjoys working on the farm, it’s hard to predict the future.